As much attention has been focused exclusively on advancing Eldor’s primary asset, the Ashram Rare Earth Deposit, yesterday’s results are an unexpected surprise. While developing the Ashram Deposit, recent work has focused on infill and step-out drilling as well as metallurgical investigations. We published articles in December and January explaining the significance of Commerce’s metallurgical breakthrough with the Ashram Deposit. Our assessment was echoed by Luisa Moreno, Mining & Metals Analyst with Euro Pacific Capital, who said in a recent interview: “I think [Commerce’s recent Ashram deposit] results are very positive”. Commerce’s latest news is in regards to regional exploration activities at the Eldor Property. The results represent boulder sampling of a larger mineralized body present on the property and highlight the potential for the property to host at least 4 highly sought-after commodities: tantalum, niobium, rare earth elements, and phosphate. Following trails of indicator minerals helped lead to the discovery of the rich diamond deposits in Canada‘s Northwest Territories. Commerce’s latest boulders were tracked in a similar fashion to the boulder train discoveries at Patterson Lake South by Fission Uranium Corp. and Alpha Minerals Inc. in the Athabasca Uranium Basin. The Ashram Deposit on Commerce’s Eldor Property was originally discovered by following boulder trains. 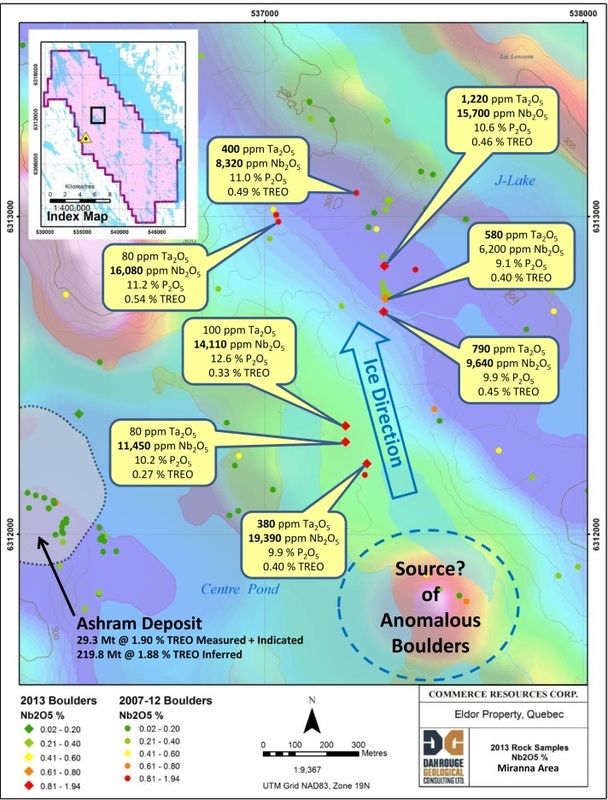 The exploration team at Dahrouge Geological Consulting Ltd., who originally discovered the Ashram Rare Earth Deposit and the Upper Fir Tantalum-Niobium Deposit, also played a role in the discovery of Patterson Lake South. Dahrouge’s experience with rare metal deposits, such as the Upper Fir Tantalum-Niobium Deposit and Elk Creek Niobium Deposit, gives us confidence in their understanding of these types of commodities and how to explore for them in several environments.